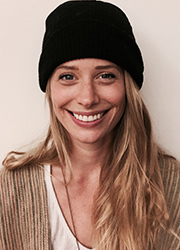 Heidi Schwinghammer (RMT) Massage Therapist in Fraserhood Vancouver. For many years Heidi has been driven by the spirit of adventure; exploring her sense of self through new languages and cultures on her travels across several continents. Through such experiences, Heidi has developed a relationship with traditional medicine and healing techniques such as meditation, however has found her true stride with massage therapy. Since then Heidi has graduated from Vancouver College of Massage Therapy (VCMT) in 2017, where she was able to explore several disciplines and develop her own mix of preferred styles and focuses. Sports and Injury based techniques are balanced by her soft spot for geriatric and palliative care therapies. She is looking forward to broadening her skill set with visceral massage and more osteopathic techniques. Heidi’s love of the outdoors and active lifestyle allow her to connect with the client’s desired outcomes. Post treatment education and exercises are not only fun and functional, but also tailored to the client’s needs. Heidi employs the use of Myofascial Release and Swedish massage techniques to optimize relaxation, to speed recovery and for general wellness of body and mind.